Yes, it’s true. But it’s actually a Ferrari Theme Park, with a Red color scheme for the main park structure, depicted below. 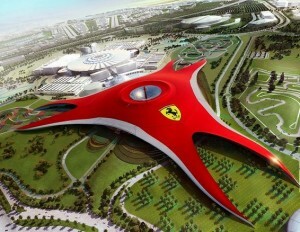 Slated to open this month, Ferrari World is located in Abu Dhabi, capital of the United Arab Emirates. Why Abu Dhabi? The Gulf region boasts a wealthy population with a passion for motorsports. The Abu Dhabi Grand Prix, a Formula One race, is held annually less than an hour away. Where else, but in one of the richest cosmopolitan cities in the Middle East region, would there be such conspicuous display of affluence and a plethora of expensive supercars on the road? 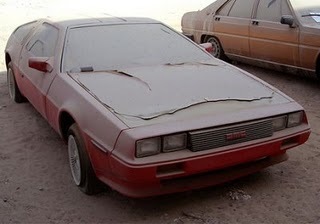 OK, I admit, if I had been asked where I thought the new Ferrari Theme Park was located, I would not have guessed Abu Dhabi. I would have guessed Las Vegas, but not based on high per capita income or abundance of Red Italian sportscars cruising the Strip. Las Vegas would have been my guess mainly because it has desert land in proximity where such a park could have been developed and it has a continuous supply of tourists. Or I would have guessed one of the Disney locations, as there are continual “thrill ride” additions to the Disney theme park empire. Ferrari Theme Park claims to fame: 1. First Ferrari Theme Park 2. World’s Fastest Roller Coaster at 150 mph // 240 km/h 3. Largest Ferrari Logo in the World (note: the largest Ferrari Logo in the World isn’t doing anything for me). Theme attractions: See above plus 1. Racing simulators 2. Theme park ride water ride thru a Ferrari engine 3. Ferrari Racing School 4. Video history of Ferrari Racing and the Ferrari Factory 5. Ferrari cars including classic and concept cars on display 6. A Ferrari G-Force Simulator Tower Ride 7. An aerial tour of Italy following a Red Ferrari driving over the road and more, more, more. 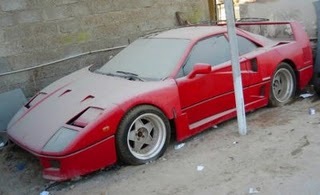 But I find it ironic that while this multi-million dollar park is opening in Abu Dhabi, not too far away, in Dubai, the largest city in the United Arab Emirates, Ferraris and other sportscars are being abandoned in record numbers due to the collapse of the building boom and cut-backs in oil company staffing. I imagine when this theme park was first envisioned, financed and developed, that the Gulf economy was not in such dire straits.